A clever design for storing your money or even a key. The Crescent Money Belt by Bison Design comes in a plethora of patterns to match any outfit. 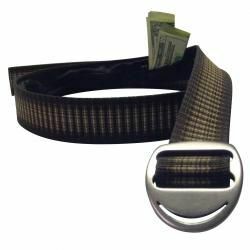 This wide belt (1.5 inches) has a secret zippered compartment on the inside that is perfect for holding extra cash – either folding bills length-wise in thirds or width-wise in half, then thirds. Because the pocket covers almost the entire length of the belt, it can hold quite a bit while traveling or out hiking. Made out of a sturdy webbing material, it works well with hiking pants or shorts, and it looks like a regular belt, but you know that it has a little something extra!